Ah, risotto. So creamy, so delicious, so comforting. In my house, it’s a food filled with love. If you ask my husband what meal I can make best, he will tell you that this is in the top 3. He may even tell you that this dish is #1. I think it depends on the day, though. Making a good pot of risotto takes time – you need to make sure you make this on an evening where you are not doing anything other than cooking and relaxing. At least an hour, I’d say. 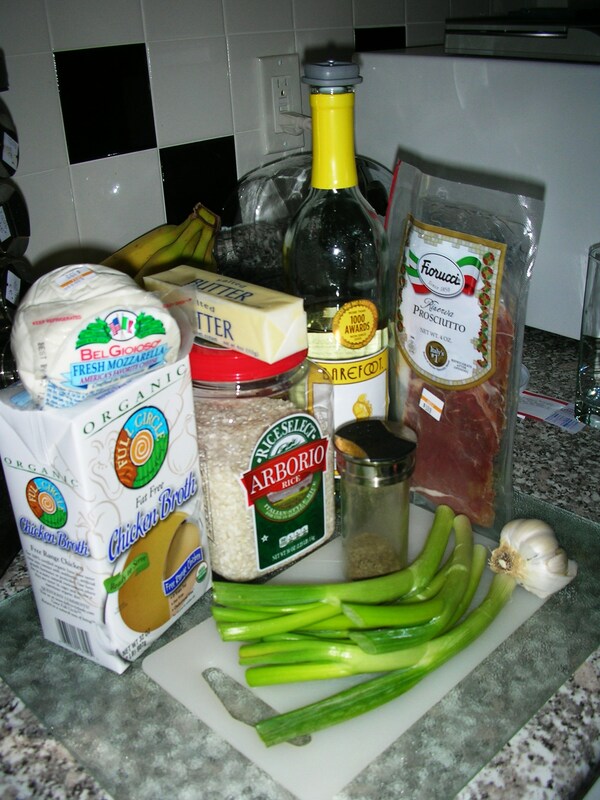 This is not food that you can just set up and forget about – you have to stir the risotto constantly. You have to keep an eye on the heat as well, and not go any higher than a medium setting. Failure to do so will create a dish that is crunchy and undercooked – yuck! Trust me – the longer this dish takes to cook, the better it is. And for those who wish to use plain old white rice – don’t. Spend the extra dollar or two and get the Arborio rice. You will not be disappointed. This past time that I made the dish, Mike insisted that I wait until it was a night where he was home to eat it ‘fresh’ and not as leftovers. In my humble opinion, however, the leftovers are just as good as the fresh pot. 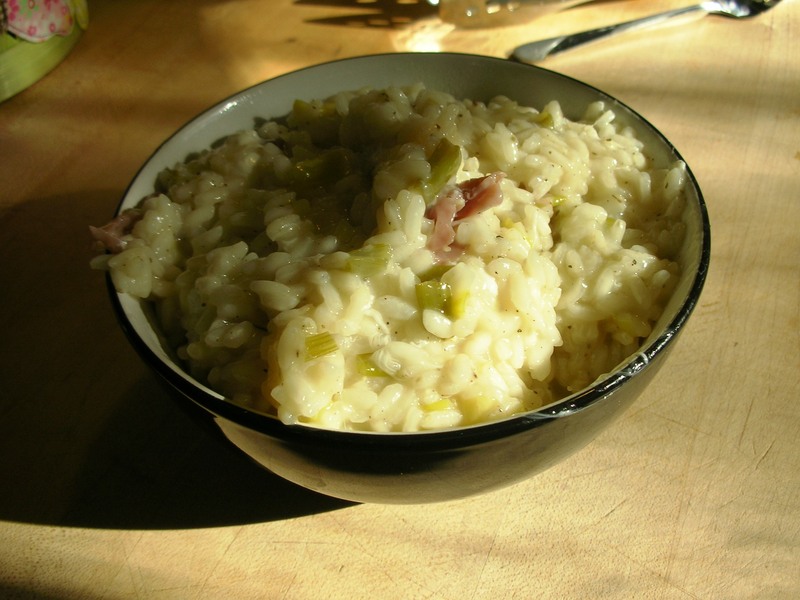 While there are many different types of risotto recipes out there, this one is still my number one favorite. I love the combination of prosciutto and fresh mozzarella; while I am not the biggest sage fan, the sage in this recipe truly ‘makes’ the dish. In a medium/large saute pan, melt butter, over medium heat. Add leek & garlic; cook for about 3 minutes until the aromatics start to brown a little – make sure to stir frequently. Add rice, salt & pepper. Cook for a minute, stirring constantly. Add wine and stir until liquid is nearly absorbed. Add broth, about a 1/2 cup at a time, and stir frequently until addition of broth is absorbed, before you add more broth again. You know you are getting close to ‘the end’ when the rice is very puffy and the texture in the pan is creamy. Stir in sage. Remove risotto from heat. Stir in mozzarella and prosciutto. Serve right away. If you have the time and the patience, I highly recommend you try your hand at risotto. The ones you live with will love it, and if you live by yourself, the leftovers are worth it. This sounds absolutely delightful. I have put it on my agenda for next week. Thank you so much for sharing. Have a wonderful week!